Breath of the wild is an awesome game! Champion!Sunset is a lovely idea and I also like the way you put the other girls into various characters from BotW. The personality match is actually well done! I could never get into Legend Of Zelda games sadly, but I know a good crossover when I see one. The Mane 6 as the Champions are very fitting. So who would be Ganon? Tirek? Lovely work as always HowXu! I know it's been quite a while, but I would still be interested in commissioning you again sometime. And I'd be happy to do more commissions. The problem is that I currently cannot find the time to do so. Sorry about that. Could I use this as a fanfic cover? I'll give you credit. But this is amazing! Well done. Sunset as Zelda - nice! Sunset would be Link... And you're just trolling, aren't you? Oh my gosh image all looks being pinkie. 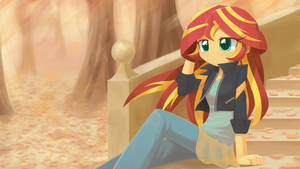 I saw this a few weeks ago on Equestria Daily.